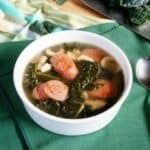 This low carb keto sausage kale soup with mushroom recipe is cooked in a chicken bone broth base. 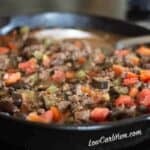 It makes a quick heartwarming meal. Although I have never cooked kale before, I bought a bunch because it was on a sale. To be honest, I had no idea what I was going to do with it. 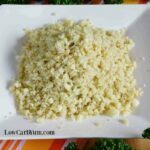 I knew that the leafy green is similar to spinach, but cooks much crisper. And, it’s super healthy so I wanted to give it a try. I had been sick for a while over the holiday vacation and was craving some some comfort food. 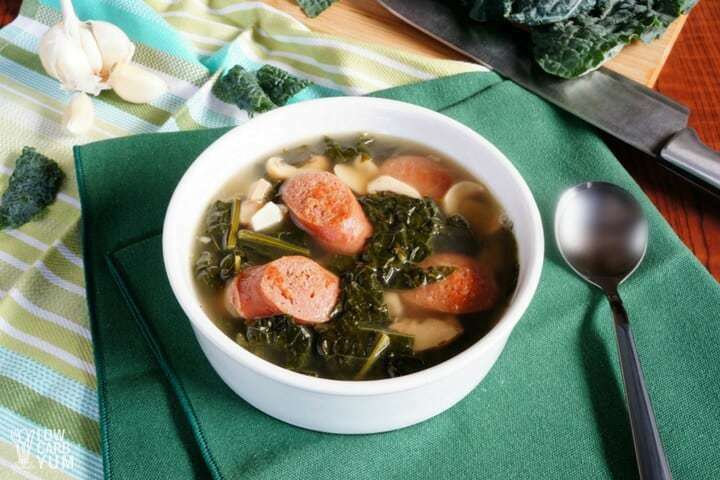 So, I made up a bowl of sausage kale soup with mushrooms. A little soup is always welcome in the winter. And, it’s the perfect meal when one is feeling a little under the weather. I’m caught a virus and had been battling a sinus infection. Thankfully, I’m feeling much better now. The soup I made is such a simple recipe. I put it together last minute as I wasn’t up to making anything elaborate. 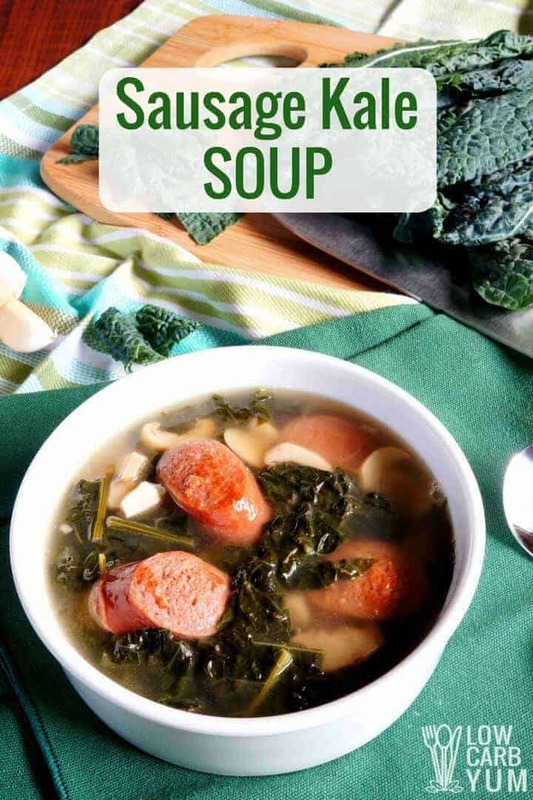 The kale was delicious in the soup. I loved that it didn’t get too soft like spinach. I will definitely buy more of this vegetable fresh in the market. Because it’s so healthy, kale is a popular ingredient for smoothies. But, I haven’t tried that yet. When buying sausage, you need to be sure to check the label. 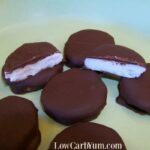 A lot of pre-made ones add sugar. 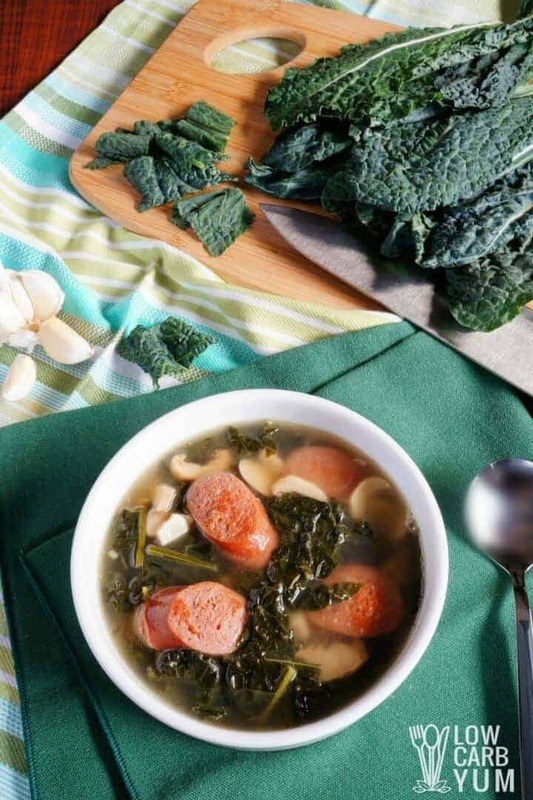 You wouldn’t want to add any unnecessary carbs to the sausage kale soup. Most of our sausage is from venison that my husband gets during hunting season. It’s made by a local butcher who doesn’t add sugar. Since I had some sliced mushrooms, I ended up adding them to the soup. I used canned, but fresh works too. 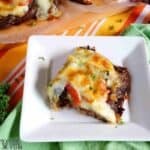 If you don’t care for mushrooms, you can leave it out. However, I find it adds a nice touch so you may want to replace it with something else. 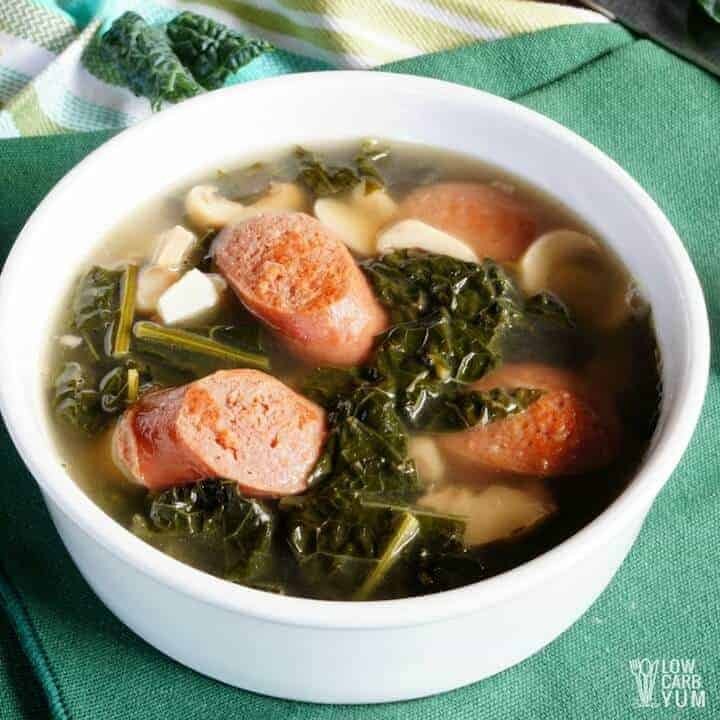 This yummy sausage and kale soup really hit the spot. Although they say to sip on chicken soup when sick, the broth in this soup is just as comforting. 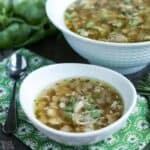 I like to make my own pressure cooker bone broth in the Instant Pot if using right away. 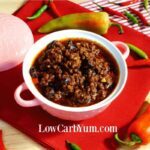 But, when I have more time, I’ll simmer it for a couple days in a slow cooker or on the slow cook setting on the electric pressure cooker. The soup certainly make me feel much better after being sick for days. And, the kale added a nice boost of nutrition. 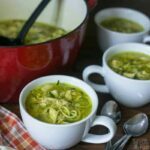 Is there really something to using chicken soup for colds? Personally, I think there is which is why I really crave sipping on warm soups when I’m sick. 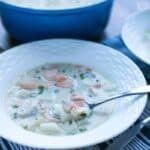 Do you have a favorite soup that you like to enjoy when you aren’t feeling well? 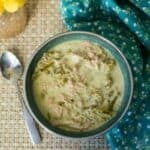 This low carb keto soup recipe is a simple blend of sausage, kale and mushrooms cooked in a chicken broth base. 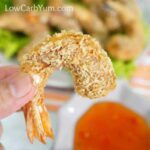 A delicious heartwarming meal or side dish. Place both cans of chicken broth in large pot along with two cans worth of water. Bring to a boil over medium heat. 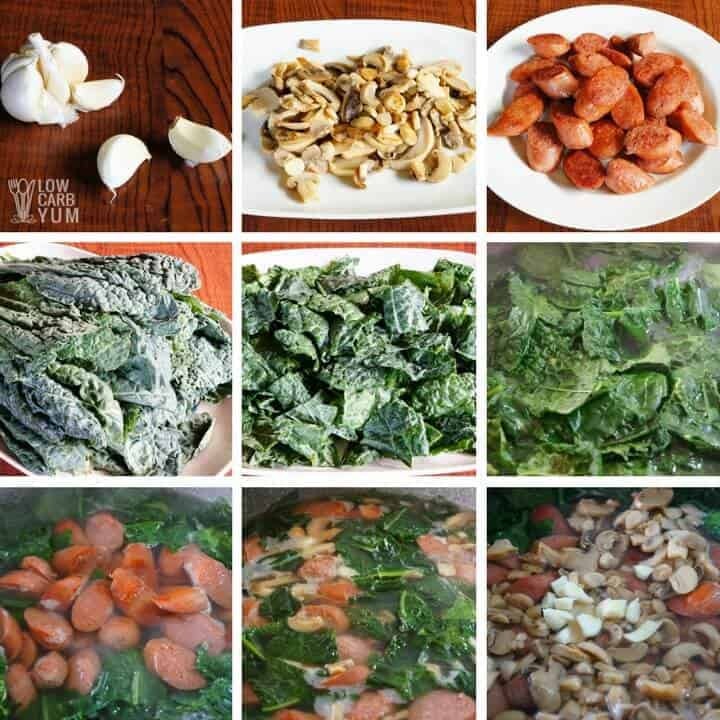 Add the kale, sausage, mushrooms and garlic. Season to taste with salt and pepper. Simmer covered over low heat for about an hour.